If you’re not segmenting your email database, you’re in big trouble. and, 24% experienced better deliverability and increased sales leads. According to the Direct Marketing Association, 77% of email marketing ROI comes from segmented, targeted, and triggered campaigns. The list of mind-blowing stats goes on, and on. But, now that I’ve got your attention, let’s cut to the chase shall we? What Exactly is Email List Segmentation? Email list segmentation is the process of breaking down your email database into more specific groups of people. Then, you can tailor your marketing messaging to each individual group to boost sales. Geographic: Country, state, city, climate, etc. Demographic: Gender, age, income, occupation, etc. Psychographic: Lifestyle, interests, concerns values, etc. Behavioral: User status, benefits sought, intent, etc. Okay, but why is email list segmentation so important? … and potentially lose a lot of business. “Getting the email with a discount for the product you just purchased. Receiving updates on a version of software that you didn’t download yet. These are the signs of a poorly segmented list and great reasons you’ll click the unsubscribe button. The more information you know about the people you’re targeting, the more effective you can make your email marketing campaigns. This is a common source of confusion. Segmentation is when you group people with common traits. Then, you create targeted marketing messaging for that specific group of people. Personalization is when you customize your message for a single user’s experience. “This is perhaps easiest to understand in an in-store context. “No large retailer throws kids’, men’s, and women’s clothes all in together. Men’s is in one section, women’s is in another, and kids’ clothes might be on a different floor. “Within each of these categories, there are sub-groupings: within women’s, you’ll find petite sizes in one area and larger sizes in another, and the kids’ clothes will be further grouped by boys and girls. Like goes with like. This is segmentation. Probably the most simple form of personalization in email marketing is addressing the recipients by their first name. Of course, segmentation and personalization go hand-in-hand. Send emails to the right people. Send emails to the right people at the right time. Send emails to the right people at the right time for the right reason. Send the right emails to the right people at the right time for the right reason. So, personalization is far more complicated to set up than basic email list segmentation. But, that’s a topic for another day. The important thing to understand is that segmentation and personalization are different things. And, right now, we’re focusing on email list segmentation only. When there are seemingly limitless email list segmentation options, how do you do it all? “A bottle of wine that costs $30 will usually be much better than a $5 bottle. But between $30 and $50, the improvement, taste-wise, will be much less noticeable, unless you’re a sommelier. “In the drip marketing world, this means that going from not having autoresponders at all, to having a basic sequence – similar to the one above – will greatly impact your small business. The benefits of sticking to simple email list segmentation are great. Because you don’t need any costly advanced tools. Email marketing services like Aweber are all you need. These basic tools make setting up your segments, automation, and autoresponders easy. For example, you won’t need to add code to your website. Okay, but how do you actually segment your subscribers? Add email list segmentation options to your sign up form. Send a survey to your existing email database. Create email segments based on your subscribers’ activity. Segment subscribers by their position in the sales funnel. Now, let’s run through each option with some examples! Your email marketing service platform will allow you to customize the questions on your website’s sign-up form. You can use this option to capture demographic data, such as gender, age, or income level. And, you can also capture data on your subscribers’ interests and preferences. Such as how often they’d like to be contacted, and which topics are most interesting to them. From this data, you’ll be able to tell a lot about each subscriber’s needs. If you ask your new subscribers for too much information in one go, you’ll probably scare them off. Because no one wants to fill out a page-long survey. So, you need to work out which data is most important for your business. Of course, this depends on the product you’re trying to sell. For example, if you sell clothes and shoes, you’ll benefit from knowing the gender of your subscribers. They ask new subscribers for their gender, zip code and date of birth. Well, knowing subscriber’s location enables Nike to share local store promotions. And, as Nike is a sports brand, segmenting by age enables them to send age-appropriate promotions to their subscribers. Let’s look at some more. Here, Sleeknote asks subscribers to share what type of business they own, work for, or represent. Understandably, ecommerce businesses and marketing agencies have different priorities and needs. So, with this simple sign-up form, Sleeknote are able to segment their list in a powerful way. In this next example, Bonobos allows subscribers to choose how often they’d like to receive emails. This allows them to slowly nurture subscribers who are just entering the sales funnel. And, sell more directly to subscribers who already trust the brand. So, ask yourself: What subscriber data is most important for your business? Gender? Age? Level of income? Interests? Then, tailor your sign-up form to collect that information so you can send targeted email campaigns. Okay, but what if you have an existing list without any demographic or psychographic data? An email survey can simply be one question with two or three options. Most email marketing services allow you to create links for each of your segments. Then, you can include these links in your emails. So, when a subscriber clicks one of these links, they’ll automatically be placed into that segment. This simple tactic can take your generic list and turn it into a sales powerhouse. Once again, you need to figure out what data is going to be most useful for your business. Say your business focuses on two overlapping interests, like camping and rock climbing. Some subscribers will just want to hear about camping and some just rock climbing. Others will want to hear about both. So, you could create three segments. “Please click one of the links below to tell us what you’re most interested in! As you can see, this one email will allow Flynn to create far more targeted messaging for each segment of his audience. How could you use a short email survey to gather more useful information about your subscribers? This is a simple, but very effective way to improve your marketing messaging. Because you can tell a lot about a subscriber by how they engage with your email marketing. Okay, but what engagement metrics should you focus on? Well, the two main metrics to use for email list segmentation are open-rate and click-through rate. And, both of these metrics should be readily available in your email marketing service. Now, let’s talk about how you can use this information to create more targeted campaigns. 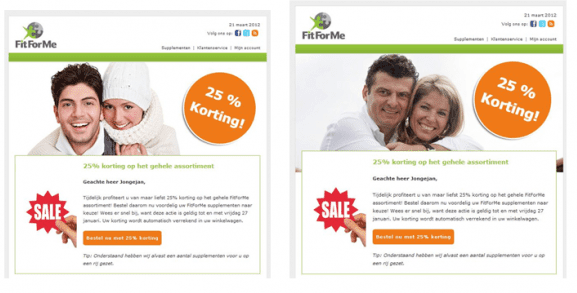 First, try segmenting by active vs. inactive users. For example, create a segment of subscribers who haven’t opened any of your emails in three months. Then, you can create a specialized email campaign designed to re-engage those inactive subscribers. Next, you could focus on subscribers who do engage and create specifically targeted campaigns for them. For example, send out an email promoting an upcoming sale and include a link for more information. Then, everyone who clicks the link can be added to a new segment of highly interested people. You can then create a special email campaign that encourages these ‘highly interested’ subscribers to ensure they become paying customers during the sale. This is one of the most effective ways to customize your marketing messaging. People should receive very different emails depending on where they are in your sales funnel. Someone at the very top of your funnel should receive generalized emails that feature a range of products and offers. Because, at this point in the sales process you need to provoke interest, introduce them to your brand, and build trust. But, what about people at the bottom of your sales funnel? These subscribers will need more targeted emails that are tailored to their interests. At this stage, you can also focus more on tactics to close sales, like discount coupons and time-sensitive offers. You’ll tend to have more information about long-time subscribers — such as if they’ve clicked on a link. Let’s look at a couple of ways you can boost sales using this method. Did you know that 69% of online shopping carts are abandoned? These people are just one step away from completing the sales funnel! So, if you can create a targeted email campaign to follow up, you’ll be able to scoop up some of those lost sales. The email includes a picture of the item left in the cart to help remind the recipient. It also focuses on solving objections the recipient might have, by reminding them that there’s free delivery, and it’s easy to return items. Like ASOS they remind the recipient of the item they left in their cart and also highlight free shipping and returns. Another way you could target people based on their place in the sales funnel is by focusing on upselling customers who have just ordered. Or, you could focus on increasing repeat sales by targeting new customers. Because repeat customers spend 67% more than new customers! You can boost your sales by creating specific, targeted messaging for each stage of your sales funnel. Okay, that was a lot — well done for sticking with me! You now understand the power of email list segmentation. And, you know of four ways you can begin to do it. Hopefully, you’ll also now have some ideas on how you can begin to segment your list to boost your sales! Still, email list segmentation can get overwhelming and confusing. Just pick one way to segment your database to begin with, and then move forwards from there. Remember, 77% of email marketing ROI comes from segmented, targeted, and triggered campaigns. Tell us how you plan to segment your database in the comments below — we read them all!